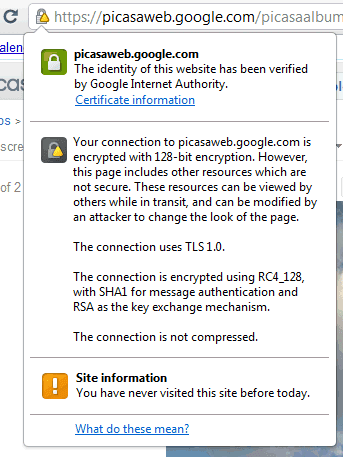 Picasa Web Albums was one of the few Google apps that didn’t support encrypted connections. Now you can go to the secure version at https://picasaweb.google.com to make sure that no one can intercept your requests. This is especially helpful if you use an unsecured WiFi connection. Many Google services support HTTPS connections: Gmail (enabled by default), Google Reader, Google Groups, Picasa Web Albums, Google Search, Google Finance, YouTube (partially encrypted). Other services only support encrypted connections: Google Calendar, Google Docs, Google Sites, Google Health, Google Analytics, Google AdSense and AdWords, Google Web History, Google Bookmarks, Google Voice, Google Latitude, Google Checkout. It’s probably easier to list the services that don’t support HTTPS.